For the cattle herder, it was Newton's third law in practice. Lions north of Kenya's Masai Mara National Reserve killed a couple of his cows, so he took an equal and opposite reaction and poisoned three lions. The man was arrested and admitted to killing the lions, which is illegal in Kenya. But he got off scot-free after a local politician reportedly intervened on his behalf. The poisonings, which occurred in April, were only the latest in a spate of big-cat killings since the start of the year  at least 25, scientists say  that have spurred new warnings that the country's lions will go extinct in the next few years. The news is equally alarming for conservationists who fear that, despite millions of dollars spent on countless programs to save the lions over the years, their efforts are just not working. Kenya's lion population has declined from 20,000 to less than 2,000 in 50 years and there are very few places in the country where the animals are not under threat. To understand why the Masai are killing lions in Kenya, you have to realize that there is a big difference between the way Africans who live among predators think about them and the way Westerners do. Tourists will spend thousands of dollars on safari vacations for the chance to see a lion in the wild. 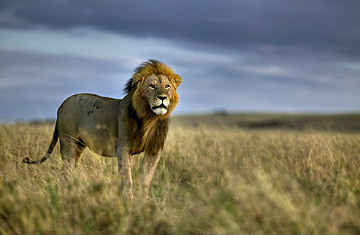 Some Masai pastoralists will risk jail time to kill lions because they sometimes prey on cattle. For the Masai, there is nothing on earth more important than cattle. Kenya's wildlife and its people now clash like never before. The country's human population has risen to 40 million, putting people and animals in competition. The situation became more dire after a punishing multiyear drought that killed cattle and, in some areas, most of the wildlife. Cattle became much more valuable for the Masai  who wanted to keep more animals than the grazing land could sustain  and for desperate predators that had little else to eat. "For a rural and impoverished people, wildlife is an expensive neighbor unless you're a hunter who actually lives on wildlife," says Laurence Frank, a wildlife biologist and project director of the research and conservation group Living with Lions. "But things were kind of hanging in there until this drought came, and it was a game changer." The bulk of conservation work in Kenya, and much of the rest of Africa these days, focuses on solving human-wildlife conflict by finding ways for people to benefit from wildlife  or at least coexist. One way is to build a tourist lodge and give the locals jobs, training and some of the profits from the tourists who stay there. Another is to rent their land and set it aside for wildlife. Another way is to pay them some form of compensation when a predator kills their animals. The drought and endemic poverty among Kenya's people have put many of those efforts to the test. One of the big flash points has been the ecosystem just north of Kenya's border with Tanzania, around Amboseli National Park. With Mount Kilimanjaro looming in the distance, its wide-open, rolling grasslands offer some of the most jaw-dropping scenery in a country full of such views. Yet the area has seen a huge number of lions killed this year  at least 17 since January, according to Frank. It's there that longtime safari guide and lodge owner Richard Bonham, with funding from National Geographic and several other conservation groups, launched one of the biggest conservation experiments in Kenya in 2003: an elaborate system in which the local Masai are compensated if predators kill their animals. Critics say the plan fosters bad livestock management: Why bother to look after your cattle as long as someone's there to pay you? They also say the lion killings are proof that compensation does not work. Bonham and his allies, meanwhile, argue that without compensation there would have been even more killings by the Masai, who either do it to protect their cattle or use it as a way of getting attention from the government, which they feel has neglected them for decades. "We've had some setbacks, certainly, but one thing is very, very clear. If we hadn't had that compensation project online, I'd doubt very much there would be one lion left in the whole ecosystem," says Bonham. "That's what's been putting the brakes on the killing." Around the Masai Mara, further west along the Tanzanian border, conservationists are trying a different strategy: creating conservation areas that are made up of hundreds of small plots rented out from individual landowners. People are paid essentially to keep their land free of cattle and as a refuge for animals. The rent comes from safari camps built in the conservation areas. That kind of system is possible precisely because the land in the area is owned by individuals, rather than by the entire community, as it is around Amboseli. And the Masai in the Mara tend to be much wealthier, having profited from the trickle down of tourist dollars each year. Questions dog all these projects: How do you sustain it? What happens after the donors leave? And will people who have come to expect rent payments or compensation for cattle losses simply retaliate and kill more wildlife? Near Amboseli, Frank's Living with Lions runs a program called Lion Guardians, which employs Masai men to keep track of radio-collared lions and warn other Masai to keep their cattle away. Other suggestions include creating an insurance scheme to guard against cattle losses or paying farmers who own land where predators might live. "I think compensation has much higher risks than, for example, rewarding good behavior," says Luke Hunter, executive director of Panthera, a wild-cat conservation group that funds Living with Lions. "Insurance programs foster better husbandry, and performance payments  paying people for the presence of lions themselves  reward farmers for having wildlife on their land." No matter which strategy Kenya's conservationists believe in, everyone seems to agree that the biggest difficulty is changing people's attitudes toward animals. The Masai have long killed lions as an initiation rite to manhood, but there was always enough space for both humans and animals to thrive. Now the only relatively safe havens are Kenya's protected parks and reserves, but animals won't stay inside unless such places are fenced off. A study last year showed that animals were dying off as quickly in the parks as they were in the rest of Kenya; it said that in 30 years animal populations in Kenya were down 40% in both protected and nonprotected areas. "What you have to appreciate is that we have traditional conservation, where people lived at peace with wildlife with occasional incidents of conflict, then we moved to the modern, national-park style of conservation," says Paul Udoto, spokesman at the Kenya Wildlife Service. "There's no black and white, there is no right answer. We are all striving to approximate what can work."